Government Safety Lockout Padlock, Zenex, 1 1/2'''', Red, 1 Key, 6/Box, Sold as 6 Each by Master Lock at Hosted Payload. MPN: PLX391478. Hurry! Limited time offer. Offer valid only while supplies last. 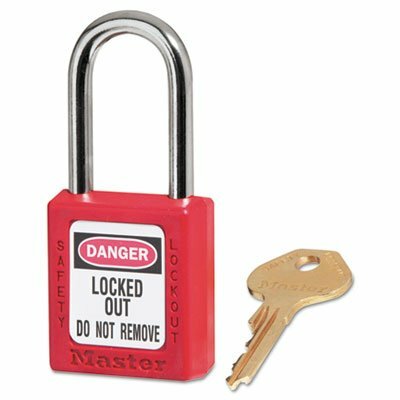 Designed specifically for OSHA lockout compliance, sturdy lock is brightly colored with a warning label. Steel shackle has 1 1/2'''' clearance. Designed specifically for OSHA lockout compliance, sturdy lock is brightly colored with a warning label. Steel shackle has 1 1/2"" clearance. Durable, non-conductive lock body is built to last. Permanent labels on lock guarantee that passersby will get the message. Complies with OSHA's ""One Employee, One Lock, One Key"" directive. Lock Type: Key Lock; Body Material: Xenoy; Color(s): Red; Body Width: 1 1/2 in. Padlock designed for OHSA lockout compliance with warning label. Steel shackle with 1 1/2"" clearance. Durable, lightweight, non-conductive xenoy body.